It’s every business’ nightmare. Something went wrong and a customer is being very vocal about it. With the internet, it’s not just their best friends that hear about it now. One person’s voice can reach much farther through their social network. That’s not even counting if the issue goes viral. We’ve seen it consistently. When something goes wrong, if the business makes an effort to resolve the issue, the customer’s perceptions can flip from negative to positive. But this is time sensitive. You have to get to the customer before they start talking about their bad experience or move on to another business. That’s where Callcap comes in. Activate our real-time call monitoring service, and every phone call will be graded and categorized based on your business’ personalized criteria. We’ll also alert you when there is a customer experience issue that you can potentially resolve. Call that person back quickly and resolve their objections. You will show that you care and that makes a customer for life. 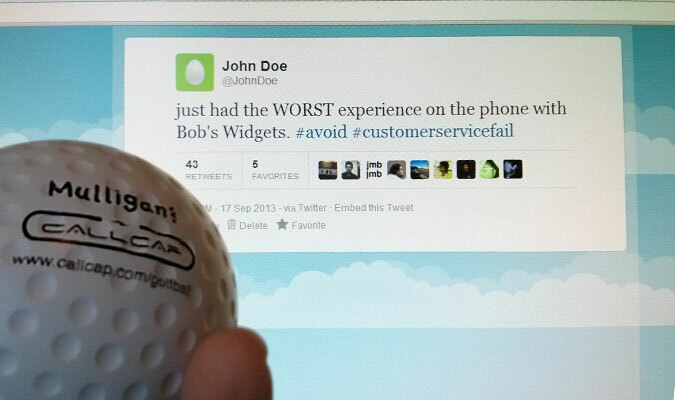 Take a mulligan with Callcap. Get started now with a free trial for a month.